I’m using jersey-pockets instead of a saddle bag on my race bike this year. I like the clean look, and I found myself swapping in the wrong bag occasionally which meant I got caught once with the wrong tube size for a flat. In order to get a tidier tool bag, I looked for ways to skinny down some of the bulk. Add to that the need to adjust the new Torx-20 standard being pushed by Ritchey on their C260 stems and I ended up at Fix It Sticks. So clever, and so simple. Most of the mutli-tools I have carried have far more options, but much of it was just extra function without a matching need. 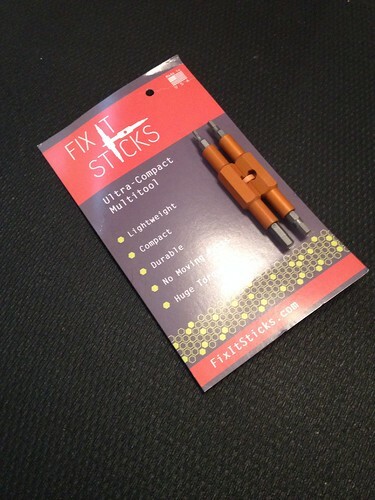 With Fix It Sticks, I was able to custom-order the bits for my bike’s needs. I can do almost everything on my bike with a 3mm, 4mm and 5mm Allen plus the Torx-20. 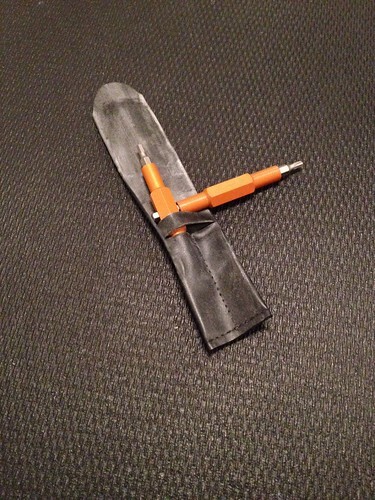 The Sticks come with a nice little tube-conversion pouch which helps from clanking metal in my tool roll. Using the tools is super easy and you have plenty of leverage when you slip one tool into the other. So now I’m riding most days with the Fix It Sticks, a tube, a CO2 inflator, and couple speed patches. Fix It Sticks is a http://www.kickstarter.com/projects/fixitsticks/fix-it-sticks-a-fantastically-unique-bicycle-multiKickstarter project done good.